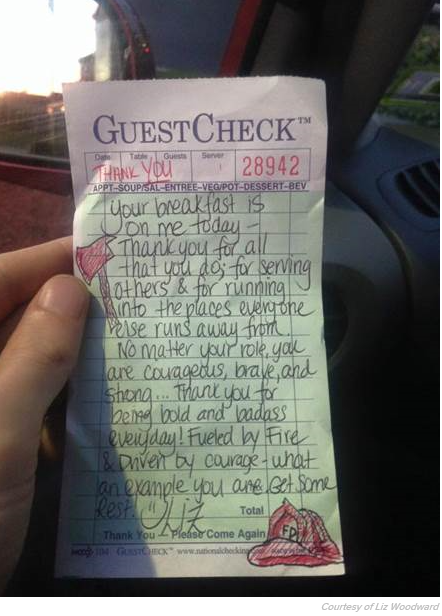 A waitress picked up the check for two New Jersey firefighters who had been working all night. It was a kind act, but what Tim Young and Paul Hullings did to return the favor was even more remarkable. 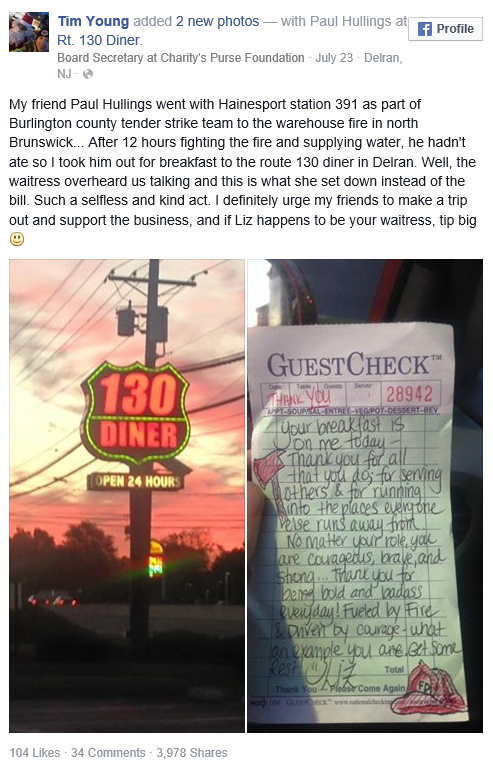 When Liz Woodward, 24, approached their table at 130 Diner in Delran, New Jersey, Thursday morning around 5:30 am, Hullings asked her to bring him the biggest cup of coffee they had and mentioned he had been up all night putting out a warehouse fire. The firefighters teared up and thanked her before leaving the restaurant. And Woodward figured she’d never see them again. When he returned home, Young posted a Facebook status urging his friends to go eat at the diner. He didn’t stop there. After he and Hullings found out that Woodward was trying to raise money for her quadriplegic father to get a wheelchair-accessible fan, they decided to help. “Turns out, the young lady who gave us a free meal is really the one that could use the help…” Young wrote in another post, highlighting the GoFundMe campaign she had started back in December. Since then, over 1,000 people helped raise $67,000, surpassing the goal of $17,000. Woodward has kept in touch with Hullings and Young, and even introduced them to her father. They’ve been sharing in the excitement of not just how much money they raised, but an inspiring message. “People from all over the world have heard our story, and from it, they’re recognizing opportunities to do something little or big for someone else,” Woodward said. Woodward has worked at 130 Diner since opening day seven years ago and now thinks of it as a second home. She credits the restaurant for jump-starting a lot of great things in her life. “This is just one example of how so many people in this world have incredible hearts and they pay it forward so the circle keeps on moving,” she said. Paying it forward is a wonderful idea. The chance to do something special for a stranger is well worth taking. A wonderful story all the way around!! Heart warming! Reminds us that the media does have power for the good. Wow! Just like ripples on a pond, every act of peace, kindness, or compassion we share affects us all! Thank you so much for sharing this beautiful story! There is such power and potential in a single act of kindness. Wonderful story, Theresa. These stories should make the headlines each day. They better direct the hearts of men and women. Good offered to another always returns manifold. Especially when offered with no purpose other than it is the right thing to do. Yes so simple, yet so difficult for too many.